I've been pretty lazy with my makeup routine recently - I've found a good day to day look that works for me and have been too unwilling to experiment. I have found that I'm using a lot more cream products for ease too, so I thought I would feature my favourite 3 this week. First up is the Maybelline Dream Touch Blush. This has actually featured in a 'This Week I've Been Loving...' before so I won't write too much about it, except the colour I have (Peach) is such a natural everyday colour that blends beautifully without leaving the skin too glowing or leaving a bright colour on your cheeks. I have used this with both the RT Buffing Brush and Stippling Brush and both work just as well. On top of this, I've been applying some of Benefit's High Beam on the high points of my cheekbones. This is an old favourite that has been collecting dust for a while, but I'm glad I dug it out as the pinky pearl colour isn't too overwhelming for daytime and I have found that it works better on the cheekbones than powder highlighters (like MAC's Soft & Gentle). The lasting power of this is fantastic too because even after a long day at college, the glow is still there, without looking oily at all. Finally, for eyes, I've been using a lot more cream eyeshadows. This glides on like a dream and the colour is so versatile, even the biggest shadow-phobes can use it! I would say it definitely needs a primer of some sort (I've found the Urban Decay one to be the best) as it can look a bit faded after a few hours without one. However, I haven't found a similar colour to this anywhere else - it's a soft taupe/purple shade which I think would suit pretty much everyone so it's definitely worth giving it a go if you're looking for a nice drugstore cream eyeshadow because they can be pretty hard to find (bar the Maybelline Color Tattoos). With the weather warming up now too, cream products are better for longevity and feel a lot lighter on your skin than powder products do. I think I'll be packing these in my suitcase when I go on holiday for quick and easy makeup application. 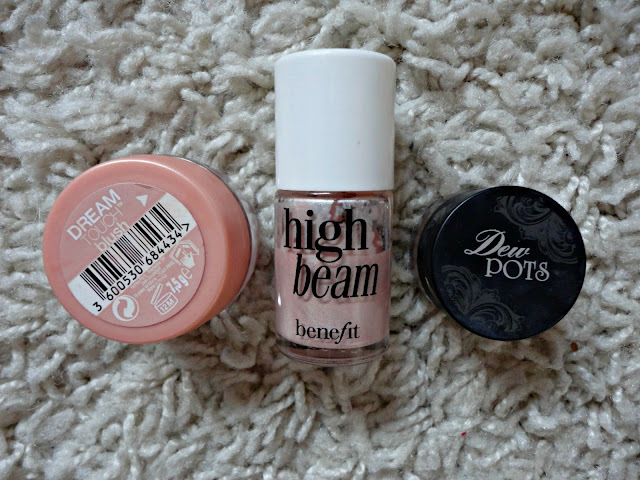 Plus, High Beam can be mixed in with moisturiser/foundation/BB cream to add a subtle glow to your skin!